Buya Hamka was born in 1908 in the rural village of Molek, Reviewing, West Sumatra, HAMKA itself an abbreviation of his name that Haji Abdul Malik Karim Amrullah, Hamka is the son of Sheikh Abdul Karim bin Amrullah, who is also a cleric in the land minang, begins work as a religious teacher in 1927 at Plantation High Cliff, Medan and Padang Panjang religious teacher in 1929. Hamka then appointed a lecturer at the Islamic University, and the University of Muhammadiyah Jakarta, Padang Panjang from 1957 until 1958. After that, he was appointed rector of the Islamic University, Jakarta and Professor Mustopo University, Jakarta. From 1951 until 1960, he served as High Civil Religion by the Minister of Religious Affairs of Indonesia, but resigned when Sukarno told him to choose between being public servants or political spicy Indonesian Muslim Shura Council (Masyumi). Buya Hamka is a figure of self-taught in many areas of science such as philosophy, literature, history, sociology and politics, both Islam and the West. With the Arabic language proficiency is high, he can investigate the work of scholars and poets in the Middle East such as Zaki Mubarak, Jurji Zaidan, Abbas al-Aqqad, Mustafa al-Manfaluti, and Hussain Haikal. Through the Arabic language as well, he examines the work of French scholar, English and German, he also diligently read and changed minds with famous figures such as HOS Tjokroaminoto Jakarta, Raden Mas Soerjopranoto, Haji Fachrudin, AR Sutan Mansur, and Ki Bagus Hadikusumo while honed his talent to become an expert speech reliably. Hamka active in the Muhammadiyah, was elected chairman of the Majlis Chairman of Muhammadiyah in West Sumatra by the Conference of Muhammadiyah, replacing SY Sutan Mangkuto in 1946. 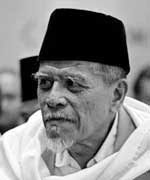 In 1953, Hamka selected as advisers led Muhammadiah Center. On July 26, 1977, the Minister of Religious Affairs of Indonesia, Prof.. Dr. Mukti Ali Hamka inaugurated as chairman of the Indonesian Ulema Council but he later resigned in 1981 because his advice was ignored by the government of Indonesia. He also journalists, writers, editors, and publishers. Since the 1920's, Hamka a newspaper reporter a few pieces such as Pelita Andalas, Call of Islam, the Islamic star and Muhammadiyah call. In 1928, he became the editor of Progress Society. In 1932, he became editor and publishes the magazine al-Mahdi in Makassar. Hamka also been a magazine editor Community Guidelines, Panji Society, and Gema Islam. Hamka also produce works of Islamic scientific and creative works such as novels and short stories. Greatest scientific work is Tafsir al-Azhar and the novels that gets public attention and a book of literary texts in Malaysia and Singapore termasuklah Sinking Ship Van Der Wijck, Protection Under the Kaaba, and Merantau to Deli. Khatibul Ummah, Volume 1-3. Written in Arabic. Defenders of Islam (Tarikh Abu Bakr Siddiq Saidina), 1929. Minangkabau adat and Islam (1929). Summary chronicle Islamic Ummah (1929). Wisdom of Isra 'and Mi'raj. Arkanul Islam (1932) in Makassar. Laila Majnun (1932) Hall Book. Majallah 'Tentera' (4 numbers) 1932, in Makassar. Majallah Al-Mahdi (9 numbers) 1932 in Makassar. Dead contains embarrassed (Copies of Al-Manfaluthi) 1934. Under the Kaaba Protection (1936) Guidelines for Community, Civic Library. Sinking Ship Van Der Wijck (1937), Guidelines for Community, Civic Library. Life in the Valley 1939, Community Guidelines, Hall Book. Migrate to the Deli (1940), Community Guidelines, Syarkawi Bookstore. Majallah 'SPIRIT OF ISLAM' (Japan Times 1943). Majallah 'TOWER' (Published in Padang Panjang), after the revolution of 1946. Traditional Minangkabau face Revolution, 1946. In the Valley of ideals, 1946. After the manuscript Renville, 1947. Three defense speech event in March, 1947. Waiting for drum sounds, 1949 in Dublin, Medium Konperansi Roundtable. My father, 1950 in Jakarta. Light showers in the Holy Land. 1950. The memories live 1, autobiography from birth 1908 until pd 1950. History of Islamic Ummah Volume 1, written in 1938 in installments until 1950. Volume 2 History of the Islamic Ummah. Volume 3 History of the Islamic Ummah. Volume 4 History of the Islamic Ummah. Guidelines for Islamic preachers, Prints 1 1937; Matter to 2 in 1950. Muhammadiyah through 3 times, 1946, in Padang Panjang. 1001 Questions of Life (set of essays dr Community Guidelines, recorded 1950). Dr Tashawwuf developments over the centuries, 1952. Four months in the United States, 1953 Volume 1. Four months in America Volume 2. The influence of the teachings of Muhammad Abduh in Indonesia (Speech in Cairo 1958), to Doctor Honoris Causa. The answer to question 1960, copied from magazine essays GEMA ISLAM. From the Old Treasury, 1963 printed by M. Arbie, Medan, and 1982 by the Library Panjimas, Jakarta. Wisdom Institute, 1953 by Crescent Star, Jakarta. Islam and Spirituality, 1972; Crescent and Star. Facts and Khayal Tuanku Rao, 1970. Syed Jamaluddin Al-Afhany 1965, the Crescent and Star. Expansion Ideology (Alghazwul Fikri), 1963, Moon Star. Human Rights in terms of Islam, 1968. Philosophy of Islamic Ideology 1950 (Returning dr Mecca). Social Justice in Islam 1950 (Returning dr Mecca). Ideals of the Islamic state (public lecture) at Universiti Keristan 1970. Islamic Studies, 1973, published by the Society Panji. The history of Islam in Sumatra. Muhammadiyah in Minangkabau 1975, (Welcoming the Muhammadiyah Congress in Padang). Muslim Way of Life, 1960. The position of women in Islam, 1973.